Note: The Canon EF 14mm f/2.8L USM Lens has been replaced by the Canon EF 14mm f/2.8L II USM Lens. Please note while reading this review that the Canon EF 14mm f/2.8L USM Lens has been replaced by the significantly better performing Canon EF 14mm f/2.8L II USM Lens. The 14 L is Canon's widest rectilinear EF lens (The Canon 15mm f/2.8 Fisheye Lens is wider but not rectilinear) and is currently the widest Canon L Series Lens. The Canon EF-S 10-22mm USM Lens is a wider rectilinear lens, but it requires an EF-S lens mount. The Canon EF 14mm f/2.8L USM Lens' unique features in addition to its wide focal length are its convex objective lens and fixed, lens-protecting metal, petal-type lens hood. As there are no filter threads, only gelatin filters can be used on this lens - they are inserted into a slot in the rear of the lens. Likewise, a special lens cap is necessitated to protect this lens. Canon supplies a nicely manufactured metal cap that slips on over the hood. A fuzzy material on the inner sides of the cap protects the sides of the hood from scratches and gives the cap some adhesion to the lens. It don't know how it could be improved, but this cap is not as nice to use as the standard squeeze-on caps. It tends to come off too easily - when I don't want it to of course. The 14 L is a small lens (3.0" x 3.5" / 77.0mm x 89.0mm) - one of the smallest L lenses Canon makes. It is very well built with one minor exception - the material under the focus ring rubber seems to be plastic. Weight is a very comfortable 1.2 lb (560g). The Canon 14 L feels very solid in your hand - it handles very well. Pictured above from left to right are the Canon EF 15mm f/2.8 Fisheye Lens, Canon EF 14mm f/2.8L USM Lens, Canon EF-S 10-22mm f/3.5-4.5 USM Lens and Canon EF 16-35mm f/2.8L USM Lens. Note: the 16-35 has a B+W UV Filter installed. The Canon EF 14mm f/2.8L USM Lens is reasonably sharp in the center wide open, but shows great improvement when stopped down to f/4 or narrower. The wide open corners do not have good sharpness even on a 1.3x FOVCF body. Full frame corners are soft wide open and begin looking decent at f/8, but the corners never catch the center-of-the-lens performance. Perhaps my biggest disappointment with the 14 L is the significant light fall-off at f/2.8 - well over four stops in full-frame corners. This can be easily seen even in the 1.3x FOVCF sample photos above - the one on the left taken at f/2.8 and the one on the right at f/8. Stopping down to at least f/8 is required to get a vignetting-free image on a full-frame body. 1.3x and 1.6x bodies will get decent results at f/4. These lost f-stops valuable to me. The 14 L is very prone to flare. If a bright sun is within 75 or so degrees of your center focus point, expect flare to be present in your results. Some barrel distortion is visible on 14 L shots, but it is rather well controlled. As usual, distortion is less noticeable at longer distances. Some CA (Chromatic Aberration) is apparent on the non-center portion of the frame. Color/contrast/saturation are nice. The 14 L's 6-blade, non-rounded aperture creates 6-sided out-of-focus highlights. But with a lens this wide, it is hard to get out-of-focus highlights. In other words, this is not an important feature for this lens for most people. If you want a diffusely-blurred background, this is not the lens for you. With a rear-focusing Ring USM (Ultrasonic Motor), the Canon EF 14mm f/2.8L USM Lens focuses fast, quietly and accurately. FTM (Full Time Manual) focusing is enabled. With a minimum focus distance of 0.8' (0.25m), the 14mm L turns in a really-low .1x magnification. And is does not get any better than this as extension tubes and extenders are not compatible with this lens. A 14mm lens is noticeably wider than a 16mm Lens but not wider than a 15mm Fisheye Lens. With the advent of 1.3x and 1.6x FOVCF DSLR bodies, wide angle lenses such as the 14 L are in great demand. The above comparison pictures were shot on a 1.3x FOVCF body. The Canon EF 14mm f/2.8L USM Lens is so wide (114 degrees diagonally) that getting adequate flash coverage can be a problem when using this lens. Expect to minimally need the built-in flip-down diffuser on an external flash. These flashes can also utilize a Sto-Fen Omni-Bounce Diffuser to yield complete flash coverage. Bouncing the flash is another method of covering a 14mm field of view. 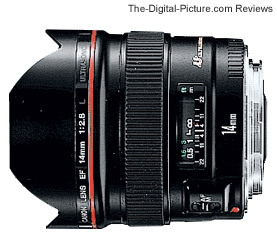 What is the Canon EF 14mm f/2.8L USM Lens used for? Nearly anything that requires an ultra wide angle lens. Wide landscapes are one such subject. Taking interior pictures of houses, vehicles and other confined spaces is a very good use for this lens. Although vignetting hurts its night-sky performance at f/2.8, this is a fine Northern Lights lens (see some of my samples). Architecture and real estate photography often have large subjects and require wide angle lenses with low distortion - these are more good uses for the 14 L.
With a few less nasties (bad attributes) and a much better price, the Canon EF 16-35mm L II USM Lens was my personal choice for an ultra wide angle lens while the 14mm was current. Although it sacrifices 2mm and is a bit larger, the 16-35 L at 16mm is sharper wide open, shows far less vignetting, flares far less easily and shows less CA. The 16-35 is weather-sealed and accepts front filters and standard lens caps. Add to these advantages the versatility of a zoom focal length range and the Canon EF 16-35mm L II USM Lens usually comes out on top in the decision making process for most other people as well. Those using an EF-S compatible body should also consider the Canon EF-S 17-55mm f/2.8 IS USM Lens. If you need to get wider than 16mm with a rectilinear lens, the Canon EF 14mm f/2.8L USM Lens should suit you well. Or, choose the Canon EF 14mm f/2.8L II USM Lens for a much better option.